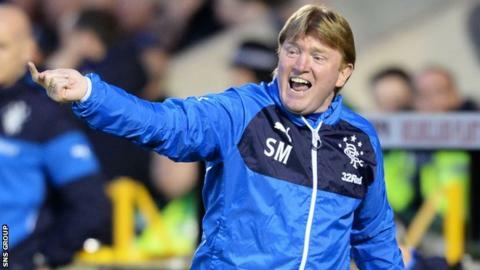 Manager Stuart McCall is urging his Rangers players to rise to the occasion when their play-off campaign opens away to Queen of the South on Saturday. "I'm confident this group of players can put in a good performance and progress," said McCall. "If you fear failure, you will freeze. The message is go and relish the opportunity to get out of this league. "This is what we've been looking forward to, what we've been building to, what the season boils down to." Rangers take on Queens over two legs, with the winners going on to face Hibernian for a place in the final against the team finishing second bottom of the Premiership. The Ibrox side have lost just one of their last 15 games but that was a 3-0 defeat at Palmerston Park. "They were better on the day than us," said McCall. "If you analyse the game, I think they scored with their first shot on target after 30 minutes. "The killer was losing a second 10 seconds into the second half, then we're chasing it and they can pick us off. "Tomorrow will be different since we will have another 90 minutes at Ibrox to play. We won't need to go gung-ho to get a goal back if we go behind. "The aim is to go through over two legs but we're looking to win down there. "We have been creating chances, which is great for a manager, but we need to cut out silly individual errors that have been costing us goals. "I've been really pleased with a lot of our performances of late. "But for a 90th-minute equaliser at Tynecastle, we'd have beaten Hearts twice, we had a good result at Hibs [a 2-0 win], so there's a lot to be positive about." Rangers trained on astroturf on Friday morning in preparation for the artificial surface at Palmerston and McCall insists the pitch is not a worry. "I'd rather play on an artificial surface than on a bobbly end of season surface somewhere," added McCall. "We've got good technical players who will suit that surface."